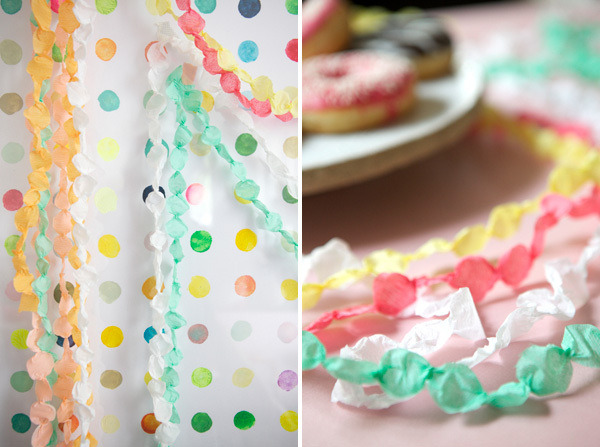 Here is a little fun party garland made out of my favorite material: crepe paper. I was playing around with it for a different project and loved how these looked like kind of like candy, or else like little polka dots or beads. They’re so sweet. 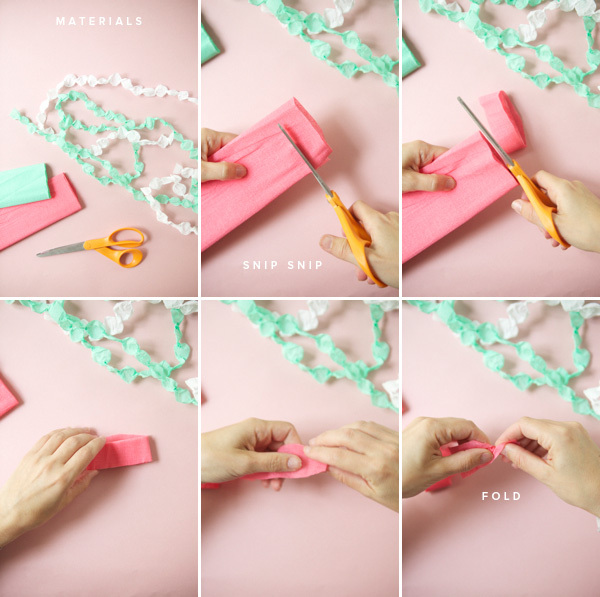 It’s a pretty simple project, all you need is a pair of scissors and crepe paper folds. That’s it! Click through for directions and more photos. Step 2: Grab the end section. Hold the paper still with one hand while twisting the paper two times with the other. The paper will fold around your fingers. Give a quick pinch to the fold to flatten and shape each little section. Step 3: Repeat as evenly as you can. Et voilà you’re done. Now eat a donut. 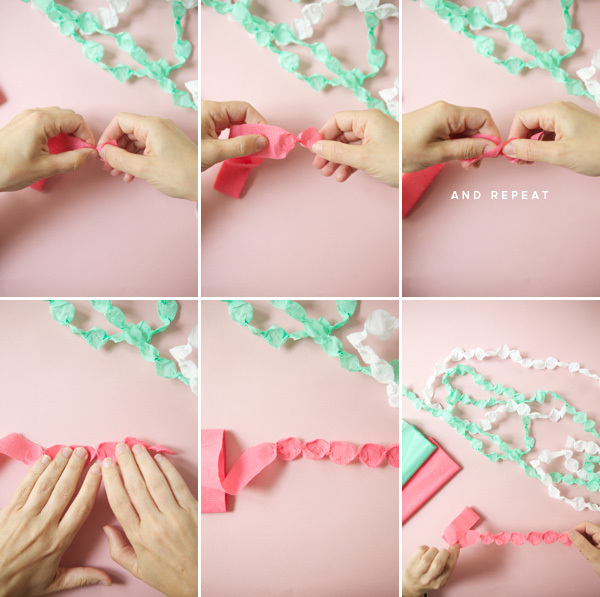 Notes: This is easy but each garland took me about five minutes to make, so if you are making a lot I would turn on a nice long tv show while you work. I tried with a bigger thickness of paper but the “beads” didn’t come out as consistent. Another variation is taking two different colored strips and twisting them together. This creates a two-toned streamer that also feels a bit heavier than the ones pictured here. SUCH a clever idea. love it. You AMAZE me with your creative mind! I hope to be like you someday!! so cute! i really like this idea. brings a whole new texture! 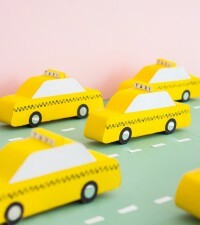 This is such a nice idea–a really fresh way to decorate with crepe paper. 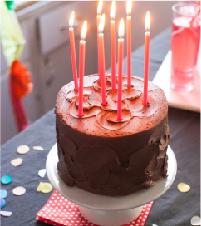 Thanks for sharing this simple & pretty craft idea! 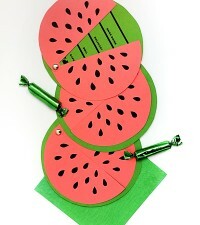 I especially like the mint color paper. Thank you for sharing this cool idea! 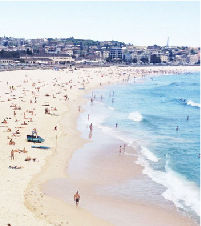 Will have to try it this summer! what a great idea, pretty and easy. now i just need an occasion to decorate for! So simple, so sweet, such GREAT effect! Love it! goodness! this is both brilliant and pretty. totally looks like candy. thank you fro sharing. i am swooning with delight here. 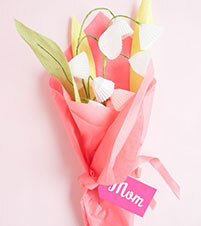 Where can I purchase crepe paper folds in nice colors? 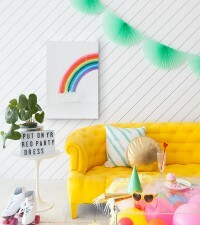 Some websites I found only sell it in basic colors I love this idea Im definitely using it for my next party photo shoot! 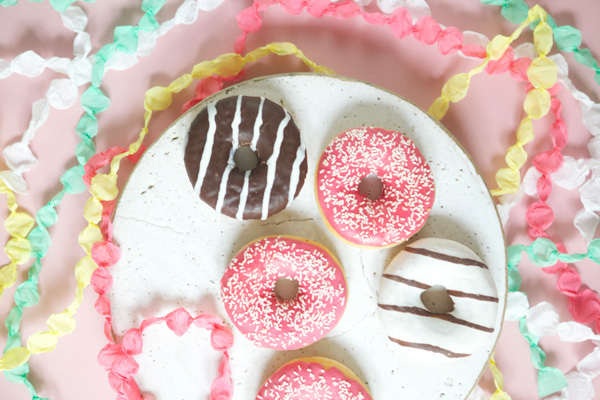 I’ve been seeing a lot of gorgeous doughnuts on a lot of blogs lately. I think someone’s trying to tell someone (me) something! I love all kinds of dots! Thanks for sharing this great and simple idea! Incredible! I love this so much! Thank you for sharing such a fun and simple little diy! This is such a neat idea! I am going to try and do it for my little girl’s 1 year old birthday party. Thank you for sharing! Definitely adding this to my collection of party idea. Genius! 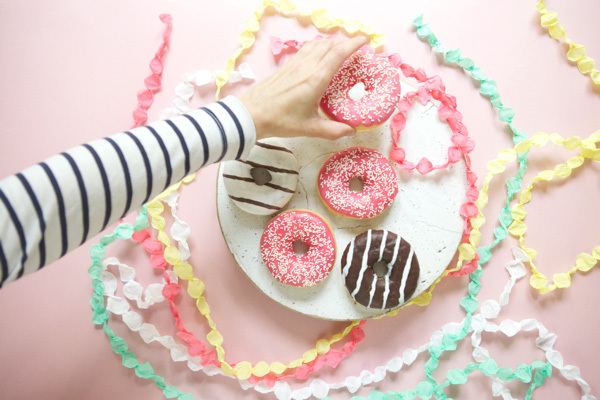 I love how your shirt stripes match the donut stripes. Tee hee! Wow. 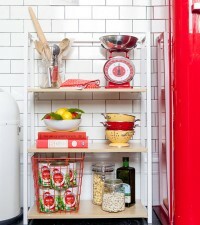 I love this DIY as all of yours. I just found your blog and am excited. So nice! Everything you do is SO COOL!! 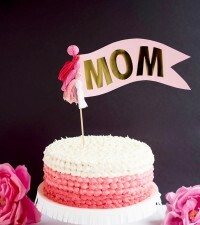 I love your blog and all the crepe paper crafts!! 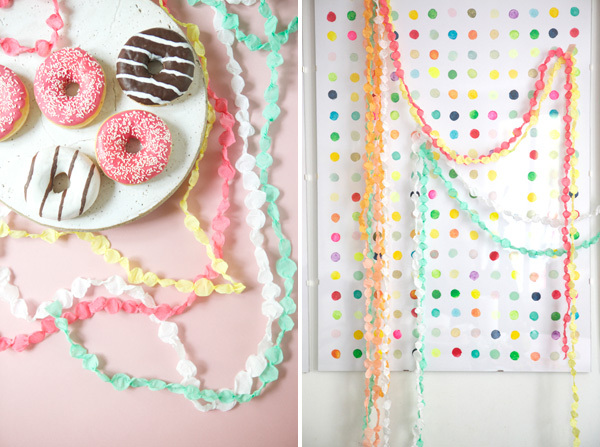 This is beautiful, can’t wait to fill my dorm with dot garlands!!! that looks so cute! Thanks for sharing. These are so YUMMY looking! What a great idea! 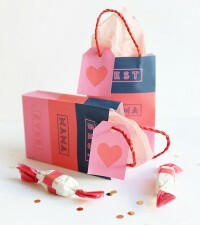 I love these idea… so simple to make but so darn cute! What a great idea! And it’s much simpler to do than I thought. Thanks for the tip! DEF my favorite project of yours, Jordan –you’ll be seeing copycats everywhere now! Call me when you’re back –we should collaborate at least once. I’m there monthly. 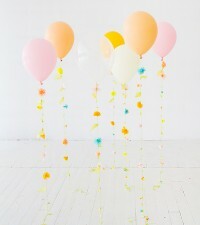 This DIY project is such a great way to add color to any party or event decor. 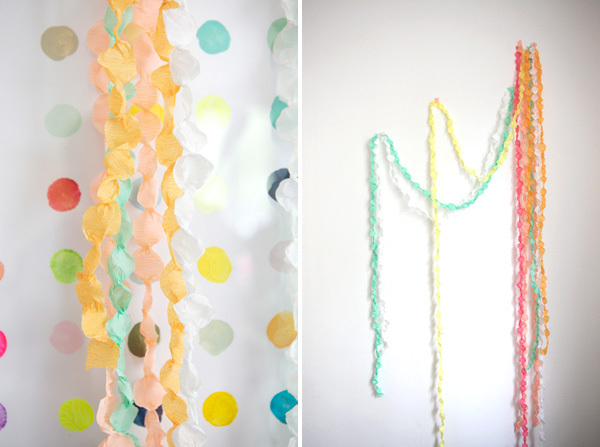 Love the crepe paper texture as it gives the garland that handcrafted touch. Love it! Original!!! 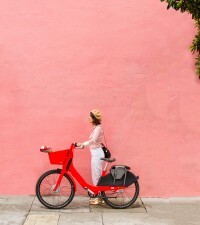 Your blog is so inspiring!!! Such a great and inexpensive project!! Love it…thanks for sharing!! Thank you. 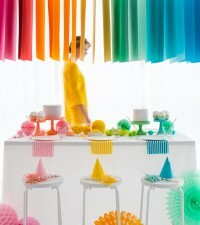 I am planning a candyland party for my daughter’s 6th birthday, and this is perfect. I love crepe paper because it’s cheap and in every color, One more decor item [check}!!! 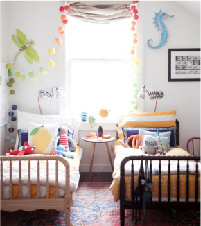 SO precious and such a fresh look for decorations. Cant wait to try it for summer parties! Thanks for the post! 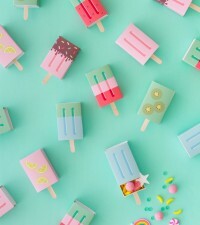 I can’t wait to make these for my baby’s first birthday I love them!!! So much fun! 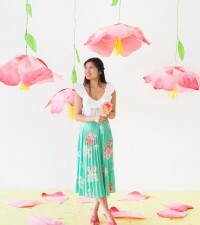 I just love Oh Happy Day’s colorful ideas! Thank you for constantly inspiring us. Love it! 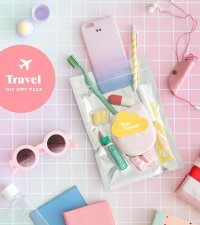 Super fun and cute! Oooo I love the polka dot background! 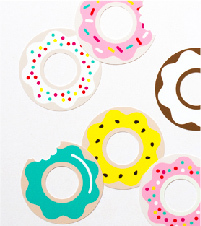 Crepe paper can be found at $tree, usually 2for $1, colors are – take your chances what they have at the time. The rolls are usually 1 3/4″ wide. That garland couldn’t be easier, just a little hand dexterity. I was thinking of stamping on the strip to make different ones to put together for variety of looks depending on occasion garland used for. Thx so much for sharing. Glad I found your blog thru the Friday party. So beautiful! It’s so easy too! I will for sure give this project a test run, before my party! Yay! You have the BEST DIY’s! I love them! Thanks for the share of this great idea ! pretty and lovely !